Boats on the beach. All photos by Sara Banks. When you run a luggage company, you do a lot of traveling. 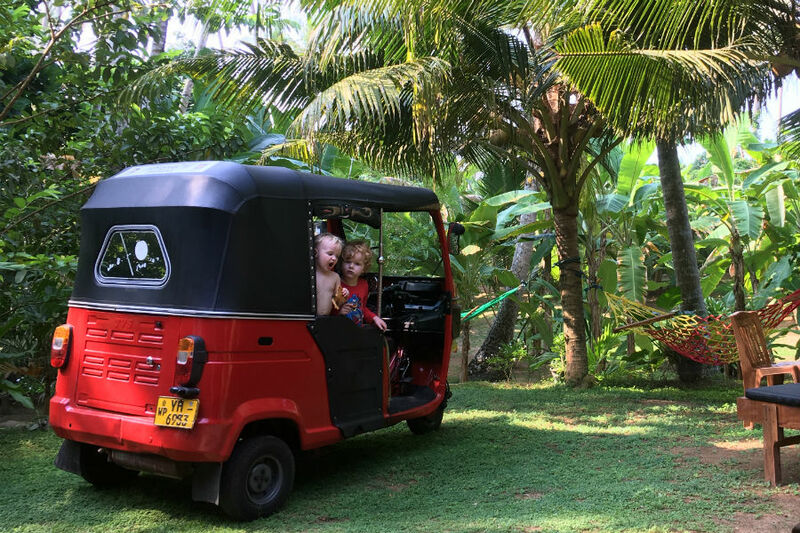 Sara Banks, founder of Steamline Luggage, just got back from Sri Lanka, where she spent a month with her husband and ... wait for it ... three boys under the age of four. So, what brought you to Sri Lanka? My husband and I first visited Sri Lanka five years ago, and to say that we fell in love is an understatement. We went for three weeks and stayed nine — it's that kind of place. We trekked up mountains, had candlelit dinners on the beach, and rented a tuk-tuk for the duration of our visit. For nine weeks, we were the unofficial taxi service for the locals. On our most recent trip, there was a small difference. Three small differences, actually: We had our young boys, ages four years, two years, and three months. When we were planning this spring trip we had just had a baby, so we needed to go somewhere easy and safe. There are no major vaccinations necessary, jet lag from Europe isn't too severe (it's only a five-and-a-half-hour time difference), and we knew we could move around easily and soak up the culture in great weather. We planned to rent a tuk-tuk again, as it's the perfect means of traveling with the whole family. The boys were always excited to get back in the tuk-tuk. As the founder of a luggage company, you're a packing expert. How did you pack for this trip? Space is minimal in a tuk-tuk, and toting around three young boys without a buggy or stroller can be tricky. Packing light was essential. After fifteen years of traveling to more than 40 countries, I finally feel like I have nailed packing light. We got the five of us in one suitcase — for a month. Each of us had one large ziplock bag, so every time we opened the suitcase, instead of it exploding within seconds, it was easy to take out a bag, find what you needed and put it back. It was a bit of a "Eureka!" moment. How did you get to Sri Lanka? We flew Etihad by way of Dubai. Etihad is a wonderful airline with friendly staff who are incredibly accommodating of children. We didn't want to disrupt the kid's schedules too much, and they had lots of options for us. The air hosts couldn't have been more helpful throughout the journey. We went everywhere in our tuk-tuk. Enjoying every single minute of the trip meant thinking about travel in a new way — looking at what the locals are doing and not just other travelers. Getting a tuk-tuk was one of those trip-defining moments. We got to travel at our own pace, stop when we wanted to stop. Travel days became the best days. With my husband driving and me in the back with the boys, we drove about five hours a day and saw herds of elephants, flocks of peacocks, lizards, and families of monkeys along the way. Our version of the Old MacDonald song now includes water buffalo (admittedly, they make very little noise). 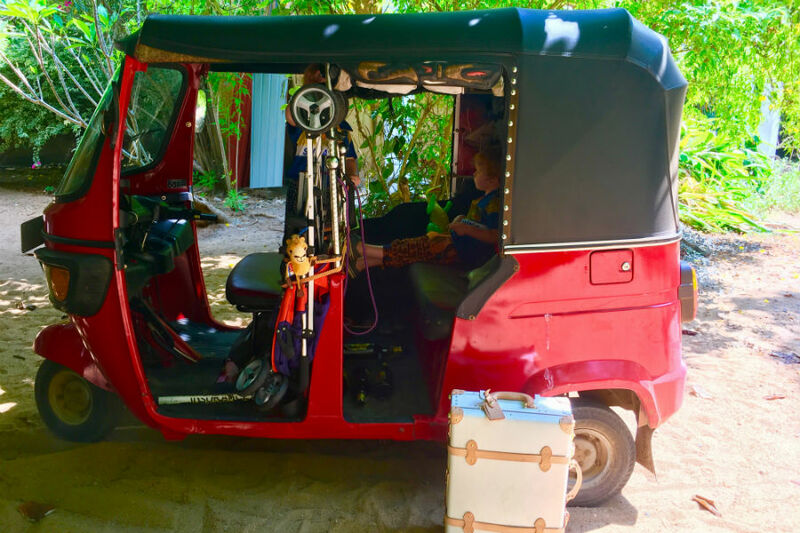 The boys were so excited every morning to get into the tuk-tuk for a new destination, but after about two hours they would fall asleep, leaving us time to enjoy the peace and quiet in a beautiful country. We started in Negombo, completely bypassing Colombo. 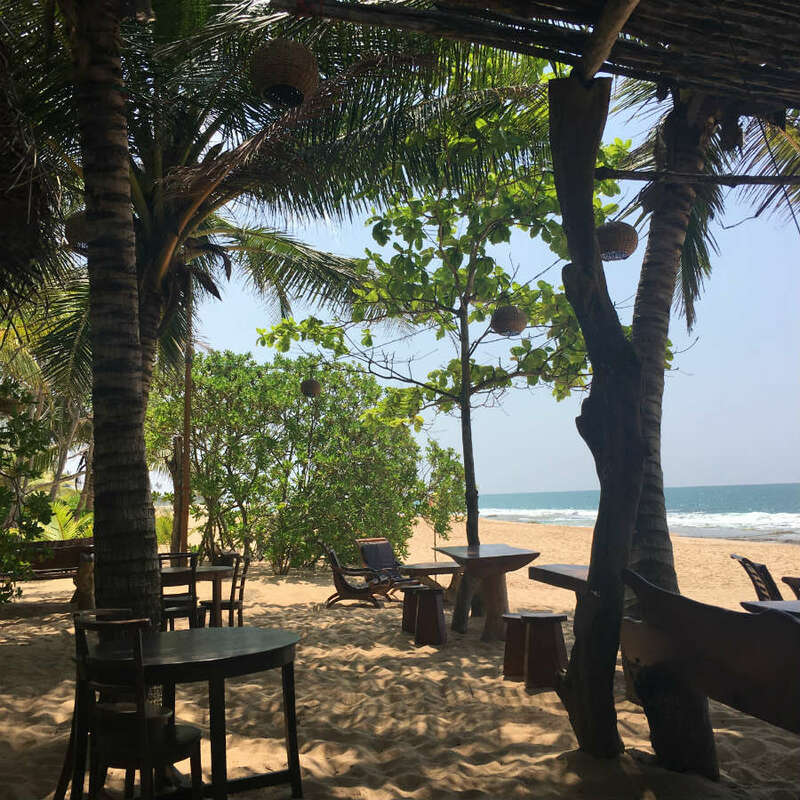 Negombo, a small town on the beach closer to the airport, was the perfect place to acclimate to the weather and settle in before exploring the rest of the island. We stayed in a small guesthouse on the beach so we could get our bearings and let the lads get used to the heat, mosquitos, sun, and sand before we moved on. Then we got in our tuk-tuk and headed down the south coast, stopping for a night in Galle. We stayed at a friend's guesthouse in the fort that we had been to before, Frangipani, and had a wonderful day catching up with him and seeing his house in the jungle, newly built after the tsunami. The entire neighborhood is comprised of post-tsunami homes, and the people have made incredible new lives there. The gardens are full of fruits and herbs and the monkeys play high in the trees. This particular home is near a plantation of rubber trees and is a wonderful escape from the bustle of Galle. A cool concrete home with a piece of Steamline Luggage. From there we moved on to an Airbnb in Dikwella. 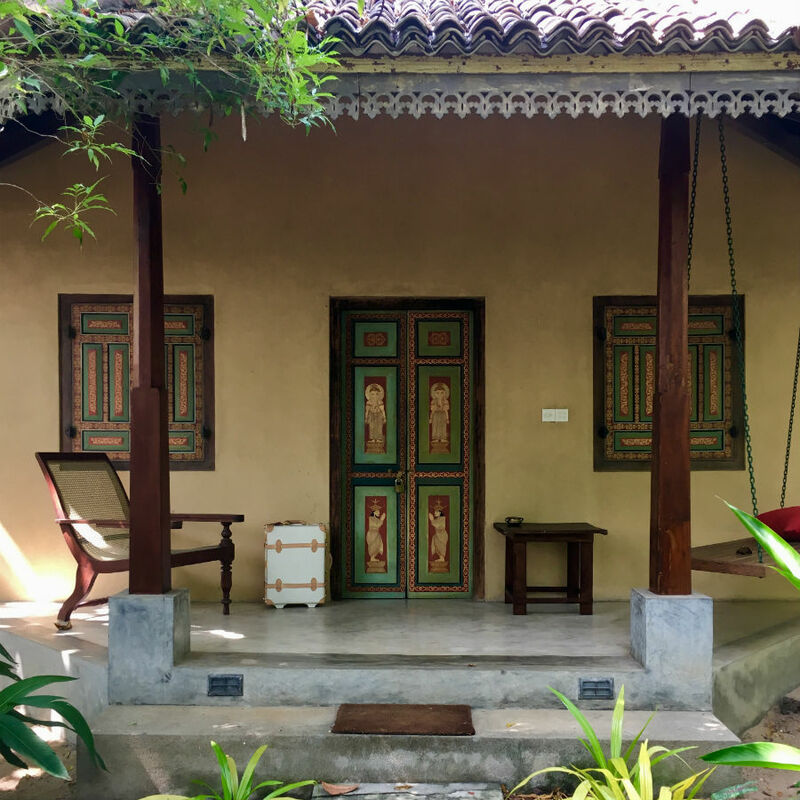 It was a gorgeous new cast concrete home that is typical of Sri Lanka: beautifully modern, secure from animals and insects, and perfect for the weather. They are remarkably cool, even though they are not like some of the airy colonial builds that you see on the island. We had private access to a beach where we could swim in natural rock pools. We enjoyed it so much we stayed a few extra days. From there we decided that a flexible schedule was best. After Dikwella, we moved on to Dikwatta, to stay in Whispering House, an original colonial home between Tangalle and another paradise beach, Hiriketiya. The latter is slightly less known by tourists and full of surfers of all levels. The little horseshoe-shaped beach is ideal for kids. Swimming was necessary to escape the heat. Fresh ingredients made breakfast extra delicious. After a few extra days in Dikwatta, we drove north to Udawalawa and went on a mini safari in Udawalawa National Park. We then made the trek east to Arugam Bay. One of our favorite places on earth is a Buddhist monestary just outside Arugam Bay. We found the most blissful accommodation, a canopy-covered garden of bungalows called Hideaway that was a total sanctuary. The beds were so comfortable, the outdoor showers were so refreshing, and the bungalows tucked in the gardens were so private and quiet. Breakfast was Western-style but fresh and original. The beautiful pool kept us sane in the 106-degree heat and heavy humidity. We did nothing but relax all day. From there, we went back inland to Ella to climb Ella's Rock and Little Adam's Peak. This was a retreat from the heat, as the tea planations and hill stations get much cooler. They feel like a completely different climate. It was great fun to watch a thick blanket of clouds move in with speed during each day's afternoon rain. Still, we're suckers for the sun, so we returned south and stayed two wonderful nights on a nearly deserted white sand beach in Tangalle called Mangrove Chalets. 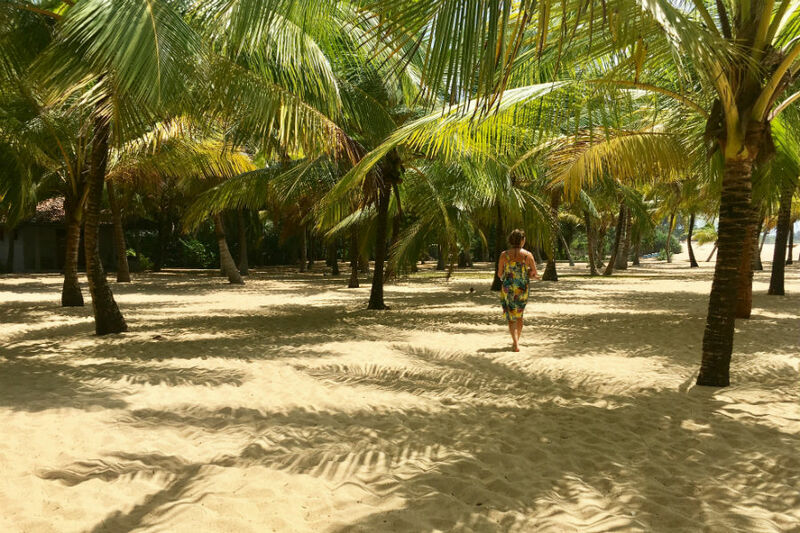 The chalets tucked in a coconut grove with palm tree shelter were quiet and blissful. Again, the natural rock pools made it possible for us to swim in the ocean. Our final stay was near Unawatuna at a hotel called Horizon Hilltop Villa. 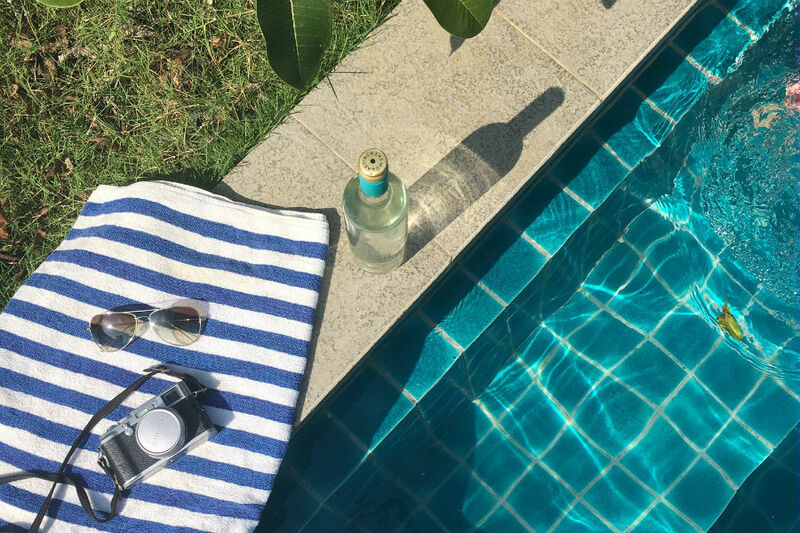 We had two of the most interesting rooms: a colonial-style one on the breezy side of the mountain with beautiful outdoor shower, and another by the pool that was built into a cave and had a bathroom with a huge fishtank. Both were incredible. The staff could not have been nicer and the food was some of the best we had on our trip. It was the perfect last stop on a blissful holiday. A quiet place to relax in the shade. The food, the people, the weather, the scenery, the cleanliness, the inexpensiveness, and the fact that everyone wanted to hold and play with our little guys. This is a country that holds eye contact with you and smiles. It's a ten-out-of-ten for families. Coconuts. In every form: water, food, oil, home decor. They use them for everything, and it suited us perfectly. I'd also love to have brought back one of the traditional woven planter chairs that decorate so many verandas. They have planks that swing out as leg rests. They are unique to Sri Lanka and very comfortable. 1. 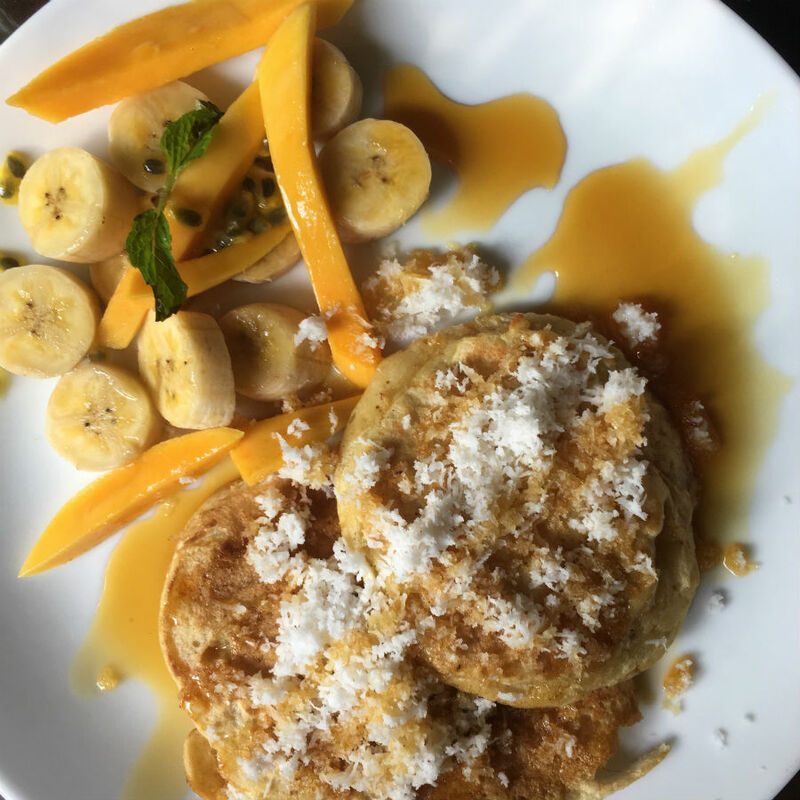 Meals: Breakfast at Hideaway and dinner at Horizon Hill Top Villa were two favorites, but the local restaurants are amazing and inexpensive — a culinary and cultural treat. It's nice not having to worry about what is on the menu. When you order in Sri Lanka, if you eat locally, the only real option is “rice and curry,” but every dish is different. And it must be eaten with the hands for the real experience. 2. 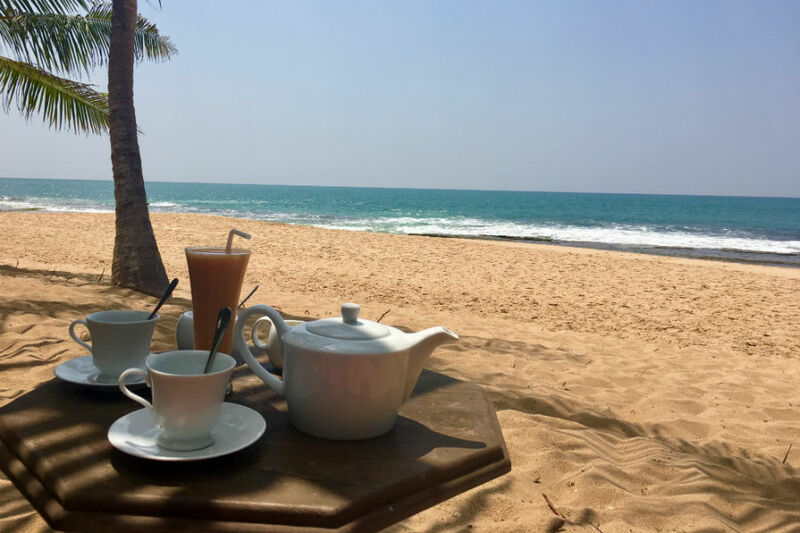 Neighborhood to explore: Galle Fort, if you can bear the heat. 3. Favorite site: Kudumbigala Monastery in Arugam Bay. If you're planning a trip to Sri Lanka and want a true experience, go to the hidden monastery on the east coast. I have never seen anything like it. It is other-worldly. 4. 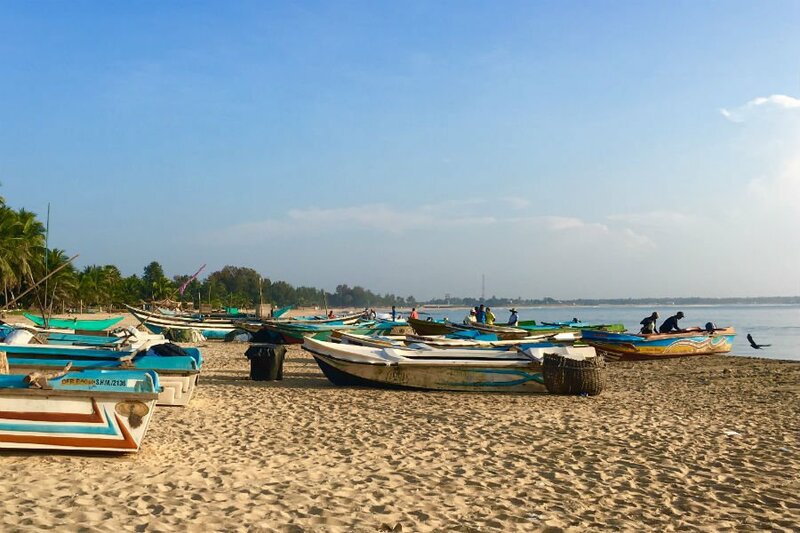 One place you didn't get to visit, but wanted to: Jaffna. Traveling at 25 miles per hour with the warm wind on my face, my three sleeping boys on and beside me, and my handsome husband driving us through some of the most beautiful landscape on this planet. It was heaven. We got the whole family in one tuk-tuk. Do as the locals do and get a tuk-tuk. It's easy to go off the tourist track, but lots of people don't. You will be so rewarded when you do. Sara is the founder of Steamline Luggage. She lives in Dublin, Ireland, with her husband and three sons. She travels for the sheer delight in adventure. To get out of our comfort zone. To remember how big the world is and how small we are in it.